Defying attempts by the Uttar Pradesh State administration to hound the organisation, Bhim Army leader, Chandrashekhar, took the battle to Delhi's Jantar Mantar today. Protesting against the recent caste disturbances in Uttar Pradesh’s Saharanpur, hundreds led by the Bhim Army, an organisation fighting for Dalit rights, gathered at Jantar Mantar in Delhi. Members of several Dalit groups gathered at the protest site on Sunday, despite being denied permission by the Delhi Police. More than 50,000 persons had gathered at the protest today. Bhim Army founder Chandrashekhar, has been contesting allegedly fabricated charges of the Uttar Pradesh Police for allegedly trying to instigate people. He was present at the event. Gujarat youth Dalit leader Jignesh Mawani and former JNUSU president Kanhaiya Kumar were among those who joined the protesters, it is reported. Late on Saturday, the Delhi Police denied permission to Dalit unions to hold a protest at the venue. “The capacity of Jantar Mantar is 5,000, and there are already several protests going on there… The permission for this demonstration has been denied,” BK Singh, DCP (New Delhi), had said. However, members of the Bhim Army announced that they will go ahead with the plan as their supporters had already reached Delhi and that more were on their way to the venue. 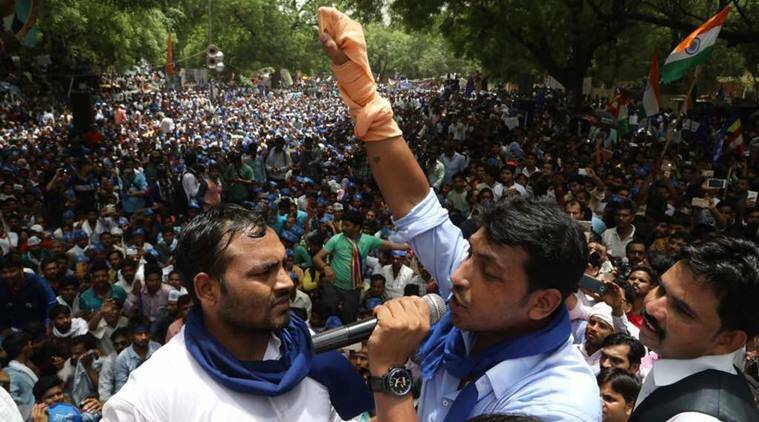 Chandrashekhar, founder of the Bhim Army, addressed the crowds at Jantar Mantar. Last Saturday, on May 13, Justice Sawant, Justice Suresh, Justice BG Kolse Patil and others had in a press statement cautioned against the sue of draconian laws like the National security Act (NSA) on members of the Bhim Army including Chandrashekar. On May 5, violence broke out in Saharanpur’s Shabbirpur village after members of the Dalit community objected to loud music during a Thakur-led procession to mark the upcoming birth anniversary of Maharana Pratap. The Dalits claimed that the Thakurs did not get permission from the authorities to hold the event. In the clashes that followed, a Thakur man was killed. Later, around 2000 members from the Thakur community gheraoed the village and burned and ransacked 25 houses belonging to the Dalits. At least 15 people were injured in the violence. Thousands of Dalit activists gathered at Jantar Mantar to protest against the recent caste disturbances in Uttar Pradesh. Weeks after the violent clashes, police arrested five members of the Bhim Army and booked Chandrashekhar. Sadar Bazar police station SHO Piyush Dixit said a case was filed against Chandrashekhar on Thursday on the basis of an audio clip purportedly released by him. The audio calls for a protest at Delhi’s Jantar Mantar on May 21 to protest against the “lax attitude” of police and administration in taking action against the violence on Dalits in Shabbirpur village on May 5. Dixit said that Chandrashekhar has been accused of staging protest against the administration and trying to create an atmosphere of violence by instigating people from different communities. Chandrashekar and other members of his organisation are also wanted for arson and violence at various places in Saharanpur on May 9. FIRs have been lodged against Bheem Sena activists Arun and Vikas Meshram.